Both of my kids are great sleepers, which is awesome at night, but means we are often struggling to get out the door on time in the morning to schlep my son to preschool. So sitting them (and myself!) down for a healthy breakfast is practically impossible. I needed some new ideas for something that the kids and I could eat in the car, that was filling, and that was delicious and overall nutritious. And I hit the jackpot with these Applesauce Oatmeal Muffins. They are so incredibly easy to make, and they come out moist, flavorful and perfect for an on the go breakfast or snack. I make a big batch and then freeze them so I’ll always have some on hand for a hectic morning. If you aren’t concerned about an increase in Points, add in some raisins, nuts or dried cranberries for extra deliciousness. Also, I chose NOT to use cinnamon in these as I often tire of cinnamon in almost every muffin recipe. I wanted something more “vanilla”, so I didn’t use it. But if you are a cinnamon person, feel free to add some in. My husband loves them as a healthy snack with his coffee in the afternoon, and I LOVE having a low Points muffin that tastes incredible and helps satisfy me. Tired of your office tempting you with those carb-heavy bagels? Make a few dozen of these Applesauce Oatmeal Muffins and treat everyone to a healthier option! These were so good and have definitely become a staple around here. Moist, filling and incredibly delicious, these tasty muffins are a wonderful breakfast on the go or a healthy snack. They are simple to make and can easily be frozen and reheated. And they are a real treat with that morning cup of coffee. In a small bowl, combine the oats and milk. Cover, refrigerate, and let sit for 1 hour. Preheat oven to 400 degrees. Line a muffin pan with cupcake liners or spray with nonfat cooking spray. In a medium sized bowl, combine flour, baking powder, baking soda, salt and sugar. Remove oats from refrigerator, and add in the egg, applesauce, and vanilla extract. Add the wet mixture to the dry, and stir until just combined. Do not over mix. Pour muffin mixture into muffin pan, and place in oven. Bake for about 15 minutes or until muffin is cooked through and a toothpick comes out dry when inserted. Remove from muffin pan and place on cooling rack. Are these points Smart points or points plus? These are the old Points Plus. Great recipe, thank you! 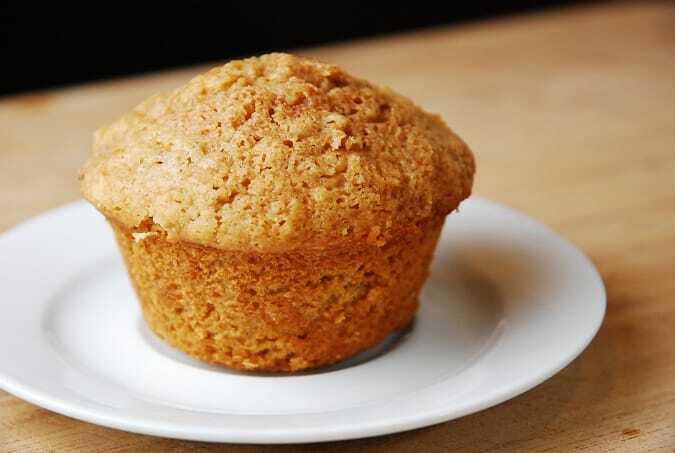 I added 1 small apple chopped and really loved the flavor of the muffins and agree with you that omitting cinnamon gave a nice vanilla flavor. I just started WW again to try and lose some baby weight and I am really looking forward to trying your recipes out. Just found your site and first recipe was a success! How much mixture do you pour into each muffin cup? Can you use instant oatmeal and just not have it sit overnight? Could you use instant oats instead and just not let it sit overnight? I added some cinnamon, they were fantastic. Won’t let me pin it to Pinterest…says wrong URL. What if we don’t have the liquid egg? Small town girl. Walmart is over 30 miles away. I have eggs though! What would be substitute? You can just use the whites from an egg. Use two whites. Brown sugar is listed as an ingredient, but the directions don’t state when it should be incorporated into the mix. Is pastry flour the same as regular flour? Never heard it referred to as such. Essentially, yes. But it is ground finer, so it gives a better, less dense result when cooked.